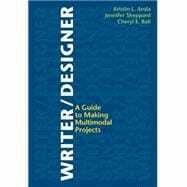 by Arola, Kristin L.; Sheppard, Jennifer; Ball, Cheryl E.
Creating multimodal projects can seem daunting, but Writer/Designer streamlines the multimodal composing process and makes it manageable for students. Designed to work in any college course, this brief, accessible book is here to help students whether they are creating a poster, a webtext, an animated video, or any other kind of text. Write/Design assignments guide students through the process of researching the right genre for their project, finding the tools to work with different media, drafting with mockups and storyboards, and presenting their final projects to the world. Online examples, tutorials, and activities in e-Pages take advantage of what the Web can do, showcasing real multimodal compositions from both students and professionals. Kristin L. Arola is an Associate Professor of Rhetoric, Composition, and Technology at Washington State University, where she directs the Digital Technology and Culture program. Her work　brings together composition theory, digital rhetoric, and American Indian rhetorics so as to understand digital composing practices within larger social and cultural contexts. Her most recent book,　Composing (Media) = Composing (Embodiment) [with Anne Frances Wysocki, Utah State UP, 2012] is an edited collection that explores how the media we produce and consume embody us in a two-way process. She is also the co-editor of the third edition of CrossTalk in Comp Theory: A Reader [with Victor Villanueva, NCTE, 2011]. Her work has appeared in Computers and Composition, Harlot: A Revealing Look at the Arts of Persuasion, and the Journal of Literacy and Technology. She resides in Pullman, WA, with her amazing husband and charming dog. Jennifer Sheppard is an Associate Professor of Rhetoric and Professional Communication at New Mexico State University, where she directs the Design Center, a space supporting students’ hands-on development of communication projects for clients. She regularly teaches courses in document design, multimedia theory and production, technical and professional communication, and online pedagogy. Her research interests include new media, information design, professional communication and pedagogy for face-to-face and online instruction. She has published on these issues in Computers and Composition, the Journal of Literacy and Technology, and several edited collections, including Designing Texts: Teaching Visual Communication and RAW: Reading and Writing New Media. She lives in Las Cruces, NM with her partner and their very busy toddler, Eli. Cheryl E Ball is an Associate Professor of Digital Publishing Studies in the English Department at West Virginia University. Her areas of specialization include multimodal composition and editing practices, digital media scholarship, and digital publishing. Since 2006, Ball has been editor of the online, peer-reviewed, open-access journal Kairos: Rhetoric, Technology, and Pedagogy, which exclusively publishes digital media scholarship and is read in 180 countries. She has published articles in a range of rhetoric/composition, technical communication, and media studies journals including Computers and Composition, C&C Online, Fibreculture, Convergence, Programmatic Perspectives, and Technical Communication Quarterly. Her recent books include a scholarly multimedia collection　The New Work of Composing　(co-edited with Debra Journet and Ryan Trauman, C&C Digital Press) and the print-based　RAW: Reading and Writing New Media　(co-edited with Jim Kalmbach, Hampton Press). Chapter 1: What are Multimodal Projects? The Modes, How Do They Work? [e-Pages] Creative Commons, Wanna Work Together? [e-Pages] Maria Andersen, Playing to Learn? But How Do I Make A Multimodal Text? Who Will Use Your Project? How/Where Will They Use It? What’s Your Future Access Plan?